The yogurt tang in the potatoes and hint of fruity sweetness in the filling combine to provide subtle, but intriguing flavors. You can save time by microwaving the potatoes. If using oven, preheat to 400Â°F. Scrub potatoes, pierce with a fork and bake until soft, about 1 hour in oven or 20 minutes in microwave. While potatoes cook, make the filling. Chop onion and dried fruit; mince the garlic. Mix 1/2 teaspoon salt into the ground lamb and brown in lightly oiled skillet. Remove lamb and drain off all but 1 tablespoon of any accumulated fat. If there is no fat, add 1 tablespoon olive oil or butter and cook the onion until golden, about 5 minutes. Add garlic, fruit, almonds, allspice, turmeric, a pinch of salt and a few grinds of pepper. Stir and cook several minutes. Mix wine and tomato paste and add to onion mixture. Stir in the lamb. Stir and cook 2 minutes. The mixture should be quite thick, but if it seems dry, add a little water. Remove from heat and set aside while preparing the potatoes. 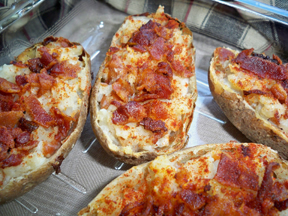 Slice baked potatoes in half the long way. Carefully scoop out the insides, leaving a thin shell of potato to protect the skin. Mash the scooped-out potato with yogurt and a pinch of salt. Use more yogurt or a little milk if the potatoes seem too dry. 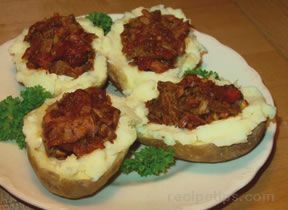 Gently press mashed potatoes back into the scooped out shells, leaving room at the center for the the meat filling. 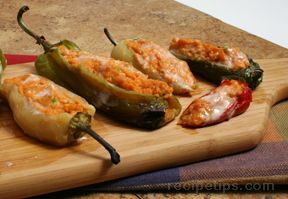 Fill and reheat in oven or microwave until warm.